Yum! Lots of pink and red. this salad is very tasty and no more then 100 kcal! (if you want to make it even less in calories, leave out the nuts they wont be missed and use only a kwarter of an orange. and maybe some more carrot. 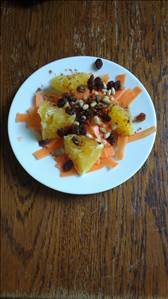 ingredients: Carrot, 1/2 orange, handfull raisins, pine nuts, pinch of fresh citron and a pinch of cinnamon. and i have my evening snack ofc, cucumber this time. Hello, hello puhpine! Your salad looks stunning, as always. I think that raisins do count as fresh food. I think raw nuts that are simply dried are still "fresh". When I researched this fresh idea earlier, I read that most raw advocates are concerned about how food is damaged or changed by heating, not drying. Vitamine C is an anti-oxidant. It protects the body against unwanted reactions with oxigen (like aging). However, vitaminC has his own reactions with oxigen. If you leave out orange juice for even half an hour the molucule structure of vitamine C has already changed. I think in that train of thoughts we can say that raisins and other dried fruit have lost (some) of their very important fuction, namely that of vitamin C carrier. I have not found other reseach about the other good things in fruit like minerals that react to the drying process. My personal opinion is that minerals will all keep contained in the dried fruit. Since there is less water in the fruit, the mineral contents are even higher then in the original fresh origin. "It is destroyed by oxygen, heat (above 70 degrees) and it leaks out into the cooking water because it is a water soluble vitamin. To preserve vitamin C in food, store citrus fruits, tomatoes, juices, broccoli, green peppers, cantaloupe and strawberries in the refrigerator uncut until you need them." "Vitamin C, also known as ascorbic acid, is a water-soluble vitamin found in fruits and vegetables, including oranges, strawberries, broccoli, tomatoes and green peppers. Vitamin C is easily destroyed by excessive heat and water, as well as exposure to air." So, maybe the little bit of Vitamin C in the centre of a raisin is protected from the air so it retains it's Vitamin C? Assuming that exposure to air causes oxidation. That is so funny, because we have a little apple tree out the back that produces a few of the most awesome little apples! They are amazing, straight off the tree. You don't even need a ladder. You are most welcome! This is such a far away island and yet we try to keep connected. Somehow.